RepairDesk refund module allows you to refund money back to customer via cash, PayPal or credit card and also allows you to generate a new "refund invoice". The refund invoice is same as the original invoice, but with a negative quantity. 1. On POS click on view invoices and find the invoice you would like to refund. 2. From the Search Filter, select status as Paid. Note: Refund option will appear for Paid invoice only. 3. Now select the invoice you would like to refund which will open this transaction in cash register. 3. Select the items you would like to refund and hit checkout (green button). 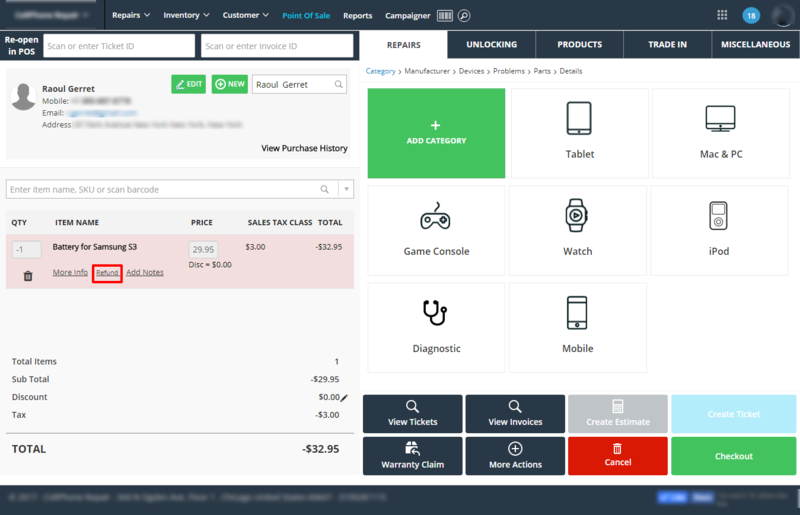 If a customer purchased different items you can remove or change quantity. This should also restock the inventory item if relevant items are setup for quantity tracking or start an RMA manually in case of faulty item. 4. Clicking on refund it will take you to a new Pop up where you can, increase or decrease the quantity and amount of the refund. 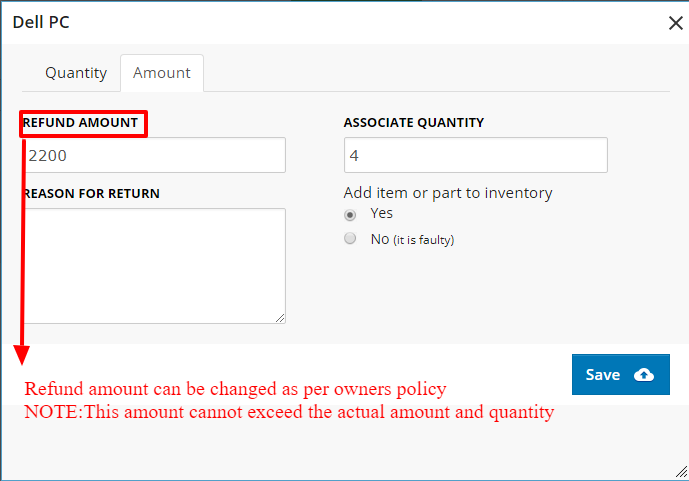 Quantity can be changed and its amount will automatically be changed accordingly. · Sometime the owner charge some amount when customer ask for refund. Here is the option for changing the amount to be refund. · If the amount is changes then it will decrease the retail amount accordingly so the margins are not disturbed.If the total amount is changed to 2000 then its retail price changed accordingly. 5.Click checkout to complete the refund transaction. 6. You will also be able to take customer signatures at the time of checkout. Note: RepairDesk doesn't have a specific exchange module, but you can use refund feature for this. Q. How can I add a faulty part to RMA while issuing a refund? A. In RepiarDesk if you're issuing a refund for an item, you also get the option to add that faulty part to a RMA. 1. Select an Invoice and click on Refund. This will bring the invoice items to POS basket for refund. 2. Click on the Refund link as (shown in the screenshot below) the item which is to be refunded. 3. A pop up screen will open where you can mention whether the part was faulty or not. 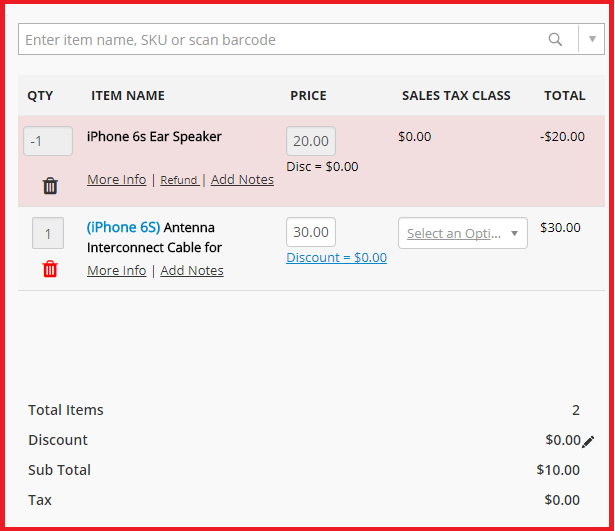 Select the checkbox No (it is faulty) if the item being refunded is faulty. Also select the option Add item or part to RMA to create a RMA for this item. You can also mention the reason for return. 4. Once you have refunded the item(s) or part(s), a pop up screen will appear, informing you that a RMA has been created the part which you have just refunded. Click on View RMA to see more details about this RMA. Q.How to exchange an item in RepairDesk? A. There is a simple workaroaund to exchange any device or item in RepairDesk. 1. Go to Invoices and create Refund Transaction for the item you want to exchange. 2. Now add a device or item in transaction. System will balance the amount you need to receive extra from customer in order to exchange the device/ item. Q. Can I Do Partial Refund? Answer: Yes you can do partial refund. You can decrease the Refund quantity and amount. Q. can I decrease the quantity while doing refund? Answer: yes you can decrease the quantity. e.g previously the invoice was made for 3 items and customer wants to refund 1 item out of 3, now by refund functionality you can refund only one item . Q. can I decrease amount of refund item wise? Answer: yes you can also change the amount but this amount cannot exceed the invoice amount for that item. Q. what is the effect of decrease amount on overall reports? Answer: when you decrease the amount while doing refund the retail price is adjusted accordingly and reports are also updated. Q. can I refund an invoice which is already partially refunded? Answer: yes you can refund that invoice which is already partially refunded. Invoice will contain remaining quantity after partial refund.